chicken nuggets + chips + broccoli = a healthy meal. This dish has broccoli, so that appeases any potential health guilt you may harbor from the fact that this dish also has bacon. But here's the thing: this pasta dish has only 6 slices of bacon but 2 cups of steamed broccoli florets, a definite healthy equation. Add to this that I use Greek Yogurt in place of the traditional pasta dish ingredient of mayonnaise and you are sitting pretty in the healthy meal equation. This dish is another great side dish for a picnic or dinner, or even a meal in and of itself! Cook the pasta according to package instructions. While the pasta is cooking, place the broccoli in a metal colander and steam over the boiling pasta, 4-5 minutes or until al dente. Meanwhile, cook the bacon and set aside. 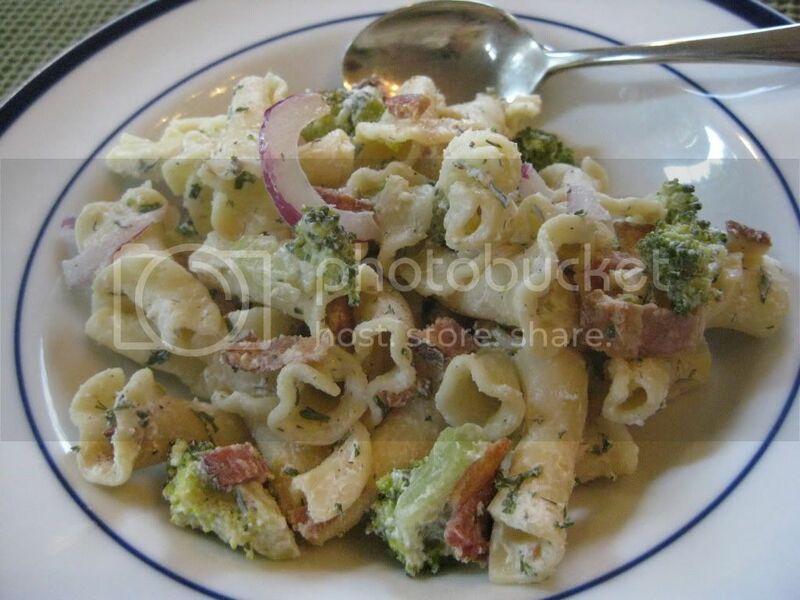 In a large bowl, combine the red onion, bacon and broccoli. Drain the pasta and add to the bowl. In a medium bowl, combine the yogurt, parsley, onion powder, garlic powder, dill, salt and pepper. Stir well and pour over the pasta. If making ahead, add a few teaspoons of olive oil to the pasta before serving, as pasta tends to absorb the yogurt sauce. *This is one of those infinitely adaptable recipes--you can easily alter it make it vegetarian and use any combination of vegetable(s) you choose! I made this without the red onion. It was addictive! My entire family liked it.